The former Frat House (etc) at 3592 University Street at the foot of Prince Arthur... demolished by McGill University. 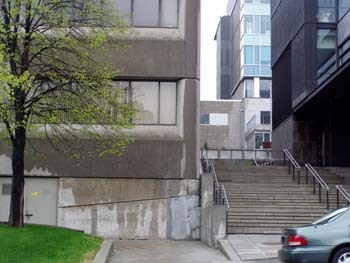 For years, the concrete front steps remained, but now those, too, are gone, replaced by a Physics Building. An abortive attempt by Alan to start an 'underground newspaper' had gotten the Frat House address into Abbie Hoffman's 'Steal This Book' (look it up!) As a result, a steady stream of strangers showed up at the door, expecting a place to 'crash'. All gone.